In 2019, Seattle's budget will total $300 million more than it did this year and $2 billion more than it did in 2012. During that time, the city has experienced a population and construction boom. 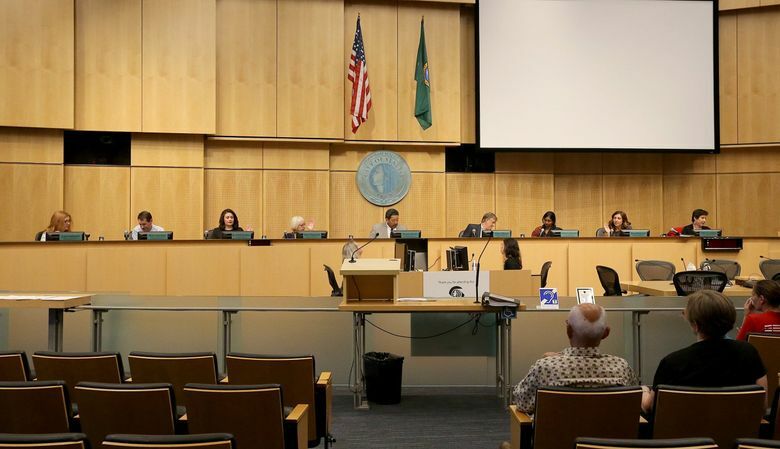 The Seattle City Council passed a budget plan Monday that calls for $5.9 billion in annual spending in 2019 and 2020, up from $5.6 billion this year. The council made only minor changes to the plan Mayor Jenny Durkan proposed in September. Council members used fund balances, improved revenue projections and small cuts to advance their own priorities with about $16 million in additional appropriations. For example, the council set aside money that will allow the activist groups SHARE and WHEEL to keep their homeless shelters open through 2020. The mayor’s plan had committed only to keeping the shelters open through June, citing unsatisfactory progress in moving people into permanent housing. Sawant pushed to replace the nearly $50 million that the city’s short-lived head tax would have raised annually for housing and homeless services. The council repealed the controversial, per-employee tax on large businesses in June less than a month after adopting it. Sawant proposed bringing it back or raising the dollars through cuts to salaries and police hiring but received no support. She blamed “a lack of political will” Monday for the city not committing more money to housing. The 2019 budget will include $1.32 billion in general-fund spending, up from $1.26 billion. The general fund covers basic services in areas such as policing and parks. Seattle City Light and Seattle Public Utilities are mostly separate. Durkan has said the plan will boost allocations for transit and transportation by $130 million next year, an uptick possible partly because the city has until now been spending slower than anticipated on projects related to its Move Seattle property-tax levy. The plan will set aside more than $90 million in 2019 for housing and services meant to combat homelessness, up from nearly $87 million, and it will make permanent some programs now being paid for with one-time money. When the mayor unveiled her proposal, she touted about $50 million in trims, including the elimination of some vacant jobs and reductions in spending across departments on travel and consultant contracts. Durkan said she wanted a budget that would help Seattle “live within our means,” because the city’s record revenues in recent years were plateauing. In 2012, Seattle’s budget was $3.9 billion. But labor and construction costs have risen, the city has launched new programs and voters have approved tax hikes for parks, transportation, housing and education. The mayor’s plan set aside money for 120 firefighter recruits, 40 additional police officers and 24 more utilities customer-service representatives. Council members sought dollars for special causes and their respective districts. For instance, District 5 Councilmember Debora Juarez secured money for a Lake City community center and an Aurora Avenue North homeless drop-in center. Her district covers north Seattle. The highly touted Law Enforcement Assisted Diversion program, which connects low-level drug and prostitution offenders with treatment and housing, will expand citywide. Police officers are set to receive tens of millions of dollars in wage hikes under the budget plan, based on a new union contract ratified by the council last week. Durkan’s plan included a 2 percent wage bump for some contracted human-services workers. Seeking money to make the raise apply to all such workers, the council considered scaling back an expansion of the city’s homeless Navigation Team, which provides outreach to and removes unauthorized encampments. Facing some blowback over the Navigation Team adjustment, the council instead decided to nix a tax break for scientific-research organizations. Councilmember Teresa Mosqueda described the 2 percent wage increase as a “down payment,” with more to come for the human-services workers, who tend to be paid much less than city employees. To pay for their adds, council members also redirected some revenue from red-light-camera tickets away from school sidewalk and crosswalk projects. Some council members criticized Durkan for using millions in soda-tax proceeds to balance her overall budget plan rather than exclusively for programs meant to link poor people with healthful food and education. But they accepted the mayor’s appropriations rather than unwind her strategy. The council added $97,000 in next year’s budget to pay for a lawyer to represent renters threatened with eviction. More than half of Seattle renters hit with eviction notices in 2017 owed a month’s rent or less and many wound up homeless, according to a September study by the Seattle Women’s Commission and the Housing Justice Project. The council voted down a proposal by Sawant to contract with six eviction-prevention lawyers rather than one.